2 x BLACK HEADSHELL. Channel separation (at 1kHz): more than 20 dB. Stylus Tip: stereo spherical tip. High quality black lacquer. Frequency response: 20 ~ 20k Hz. Excellent condition genuine technics headshells. 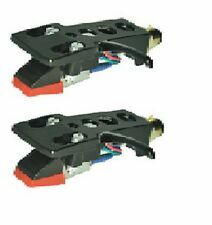 PAIR of TURNTABLE HEADSHELL. Suitable for most makes of DJ and Hi-fi turntables. • Stylus cover for extended life span. 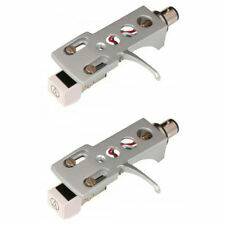 Fits most industry standard tone arms as fitted to hi-fi and DJ turntables. • Rubber washer for snug fit to tone arm. 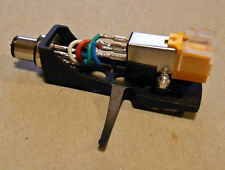 Headshell to Suit Technics SL1200 SL1210 and many others. Each wire is colour coded. Black with 1/2" H-4 Mount. Wires are made of oxygen free copper (OFC) for a cleaner sound. Sn-P bronze is an elastic copper-based alloy with a good surface quality ideal for gold plating. BLUE = LG (left ground). BLACK Die-Cast Aluminium HEADSHELL. Black Headshell suitable for most popular Japanese origin turntables. Suitable for Hi-Fi and DJ applications. Of course, I am very happy confirm you are buying the correct item. COPY & PASTE THE LINK BELOW TO SEE ALL OF OUR 1000 PRODUCTS FOR SALE. SILVER Die-Cast Aluminium HEADSHELL. Suitable for Hi-Fi and DJ applications. Channel Separation 20 dB at 1kHz. I've got loads of. 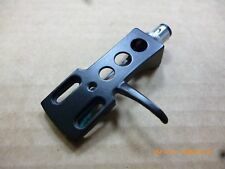 3g HEADSHELL WEIGHT / SPACER - NEW PART. SFPZB3501-1 replaces SFPZB3501. 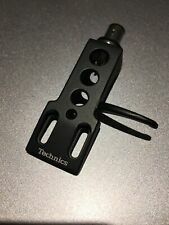 Genuine Technics Part Headshell Weigh or Spacer 3 gram. Kam Headshell With GT Stylus. rarely used and in great condition tested over the weekend and in good working order Please see pics and make me an offer on this headshell with stylus Dispatched with Royal Mail 2nd Class. COPY & PASTE THE LINK BELOW TO SEE ALL OF OUR 1000 PRODUCTS FOR SALE. PRODUCT CODE NUMBER - N/A. 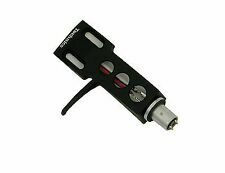 QTX Standard Headshell for Vinyl Record Turntable Decks (Headshell Only). 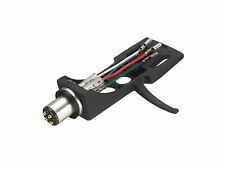 Genuine Technics Headshell Stanton 500 Cart & Stylus!!! Tested and fully working. Good condition. They will be carefully and professionally packaged and sent in a proper box to ensure they arrive exactly as they leave. Which isn't always needed but good if scratching! stanton headshell and 505 cart. Condition is Used. Dispatched with Royal Mail 1st Class. 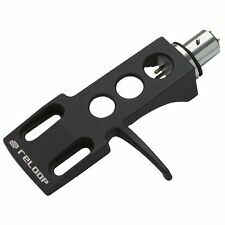 Reloop's headshell caters for 1/2" pick-up systems. It is durable and of high-quality, making it ideal for professional scratching. Key Features Made of High Quality Aluminium. Altai Black Headshell. BOP DJ Showrooms. Why people choose Bop DJ. Professional Installation Required No. Compatible Models Any industry standard turntable. NUMARK CC1 PREMIUM DJ HEADSHELL. CARTRIDGE NOT INCLUDED.. IN EXCELLENT CONDITION. HEAVILY BUBBLE WRAPPED FOR SAFE DELIVERY. ANY QUESTIONS PLEASE DON'T HESITATE TO CONTACT ME. Analogis HS-10 Turntable Headshell to replaces the Technics SFPCC31001K. Fits models: SL1200, SL1210, SL1600 & More. Black Alluminium Construction. Turntable Headshell ( KAM ). Condition is Used. Please take a look and make me an offer Dispatched with Royal Mail 2nd Class. Official Vestax turntable headshell with Stanton 500 Stylus. Used but fully working. Stylus got plenty of life, can sell without. Note - a stylus is included, but this is a replaceable part - so you can buy a new stylus. It will be worth the wait however. 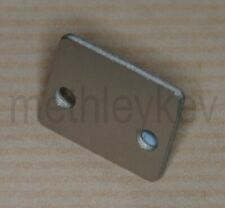 Generally good condition, with a few marks where the mounting screws have previously been fitted. Part number SFPCC31006K. These Silver Headshells are. Technics Headshell : Part no. It's compatible to SL-1200 or SL1210 series and the models as below ;. Defected goods, Lost will be fully responsible. We can do better than that. It’s original part from Japan, Made in Japan. 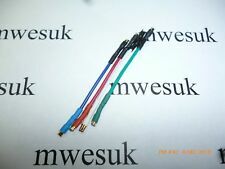 Shell wire CU-litz (OFC copper). Each wire is colour coded. Wires are made of oxygen free copper (OFC) for a cleaner sound. Of course, I am very happy to check you are buying the correct item. Stylus type: Conical Diamond. Frequency range: 20-20,000 Hz. Channel separation at 1 kHz: >16 dB. Channel balance at 1 kHz: <2.5 dB. Part number SFPCC31001K. These Black Headshells are. Note - a stylus is included, but this is a replaceable part - so you can buy a new stylus. 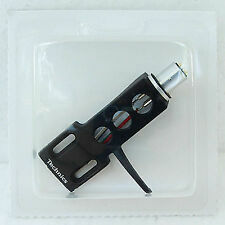 Shure have discontinued this product and it is highly sort after for DJ's across the world. Note - the stylus is included, but this is a replaceable part - so you can buy a new stylus. It will be worth the wait however.